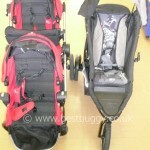 Here is a Phil and Teds Dash side by side with a Baby Jogger City Select. Is the City Select long? Will it fit on a bus? What is the best tandem to fit on a bus? 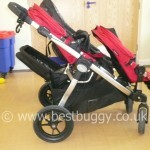 What is the best pushchair for stairs? 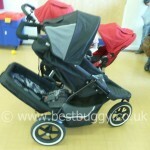 This was an interesting set of photos for me to take as I firmly believed a Phil and Teds was much smaller than a Baby Jogger City Select – but amazingly it isn’t! The obvious difference is round the back – the Phil and Teds Dash Doubles kit second seat is tucked underneath the main seat. 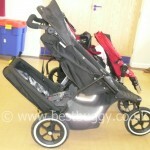 Whereas the Baby Jogger City Select has the second seat at the front giving both children an excellent view. A lot has been said about how heavy the weight over the front wheels makes the City Select especially going up kerbs but the owner of the Dash said she was finding kerbs a real problem mainly because of the Double’s kit at the back. I have to say the City Select is not the easiest to get up kerbs, but I have to say I have become wise to finding dropped kerbs and when I do need to go up a kerb you have to think a bit in advance and push down hard on the handlebar before you get to the kerb and then up you will go! Having the seat at the back on the Dash presents other issues. The owner was very keen to point out that the brake is activated by pressing two buttons and then folding the handle down. She said that its right above the face of her baby in the cocoon and she doesn’t like that. It also makes it very very hard to extract the baby from underneath without hitting them on the handlebar. Later we had the pushchairs outside and she said that the brake has to be applied every time they stop or else the pushchair rolls away even on flat surfaces. The City Select meanwhile was solid even on a slope and didn’t move (not that I recommend you don’t use the brake). But it meant that the brake on the Phil and Teds can’t really be left off to extract the baby. The owner was also keen to show how it took two button presses and then a handle push to put the brake on. The City Select has one simple brake handle on the side that you flick up or down. So going back to the start of the post the most obvious difference is round the back where there is the double’s kit. This leaves very little space to put shopping or hang a changing bag. Although it is expressly not recommended I always hang my changing bag / handbag from the City Select handle if the basket is full. But just look at the basket. It is enormous and more importantly, easily accessible from all sides. There is an expanding section at the back and zips at the front. The strong mesh easily holds 4-6 full bags of shopping and as you can see, I have hooks on the handlebars for more (again not recommended by Baby Jogger) because the City Select is solid! There is no fear of it tipping. The City Select handlebars extend whereas the Dash handlebar moves up and down to give height adjustment. Please note in the photos the City Select handlebar is partially extended whereas the Dash one has been lowered. There is a slight recline on the Dash lower seat but you can’t really recline the upper seat (which has a multi positional strap recline) much because it would be in the face of the child below. The City Select in this position wouldn’t recline. But whereas there are just four modes to the Phil and Teds Dash (single baby, single toddler, newborn & toddler, and two toddlers / older babies) there are at least 19 configurations that I know of for the City Select. So if you have a baby or toddler who likes to nap then you would choose a configuration eg both parent facing or children facing each other which allowed the seats to recline. The seats on the Dash have comfy liners whereas the City Select seats are canvas. The Dash hood is a very flimsy affair…very thin and floppy until you popper it into place once its open. But I struggled to push the poppers on sucessfully on one side and to be honest the coverage wasn’t great. It’s hard to see on the photos but the City Select hoods were almost double the size and simple to pull up and down. You can however see the children in the Dash easily as there is no hood on the lower seat and there is a gap at the back of the upper seat. But personally I like my babies to be snug with no drafts in their seats in winter! The Dash owner said that the raincover was great except when the doubles kit was on top. In this mode the raincover was in her son’s face and he wasn’t happy about it. She also pointed out that in this mode, the top of the seat sticks into her 2 year old son’s neck. There is a bar there under which the seat reclines, so once the child is taller than the bar then the lower seat won’t recline. But the mum wasn’t happy about her son being so uncomfy. The raincovers for the City Select are fairly tight. It is night impossible to get one on the lower seat when the children are facing each other and there have been comments about shopping getting wet. I know you can buy a rain cover for the City Select shopping basket, and I am keen to find a tandem – throw over the top – type raincover that actually works well for a City Select – so if you know of one then I would love to hear from you! The owner wasn’t happy with having to remove the back seat to fold. She showed how tricky she finds putting the double’s kit on. She wasn’t happy that the handle bar hit the ground during folding and that you used it to stand the pushchair up, but I know quite a few pushchairs are similar. The City Select will fold with one or even both seats on if they are in the correct positions. Whilst some see removing the seats as faffy on the City Select, they do remove easily with both hands and it does literally take seconds. The City Select folds flat in a pile. The Dash folded up nicely once the doubles kit was removed. She said her daughter had only lasted four months in the cocoon and really wasn’t supposed to be in the seat until 6 months but she had no other choice. My son meanwhile was very comfy and had loads of room in his City Select carrycot when he came out of it just before 6 months old (because he didn’t want to be laid flat any more!) 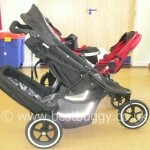 However the carrycot at the front of the City Select does make for a longer pushchair – but its only for a few months! But I know people like the Phil & Teds because they can see the baby easily and I have to say I was surprised how open the back section actually was! For me the issue with the Phil & Teds Dash, that would have been the biggest, is constantly hitting my knees on the lower seat. I am 5ft 6ins and I couldn’t walk without hitting my knees every stride. Someone else tried and did the same and said it didn’t bother them that they were hitting the seat until we pointed out that even though they maybe didn’t like it, the baby in the seat probably wouldn’t enjoy being hit from behind every few seconds! I asked if the owner of the Dash would be able to bump the buggy up and down the stairs, but said she wouldn’t even try because of the baby in the doubles kit. I would suggest it would be hard to hang onto the pushchair to bump down steps at arms stretch with the doubles kit in your knees. It’s something I hadn’t thought would be an issue until now. The City Select wheelbase is 3.4cms wider than the Dash. 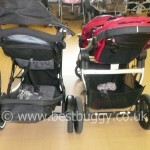 But if you look at the photo with the pushchairs facing head on, you can see that the Dash has a much much longer wheelbase and the front wheel even extends further than the front seat of the City Select. Not only that but the Doubles kit at the back protrudes further than the City Select handlebar. So very very surprisingly everyone present had to conceed that that City Select was actually shorter than the Dash. Even when we turned the City Select around so that the seats faced each other – this is probably the longest seating mode - the City Select was still marginally shorter mainly because of the Dash Doubles kit again! I have to confess this is a very ‘on the surface’ review because I haven’t used the Dash in real life. But the owner is not happy with her Dash and said she was going to sell it. She did say that it was fab as a single though. I would suggest though that the Dash is probably easier to push with the air tyres and better weight distribution. Meanwhile I have to say I am really surprised that the City Select is shorter than the Phil and Teds Dash….very surprised!